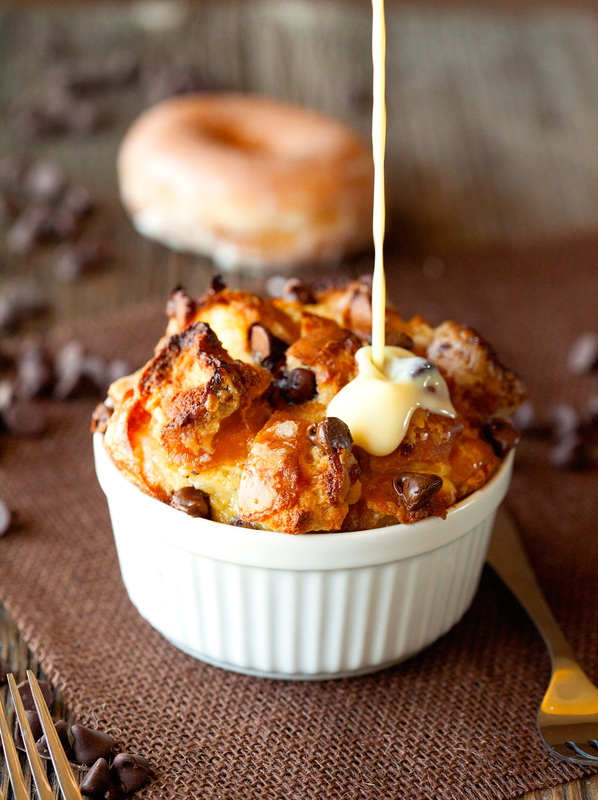 Glazed Donut & Chocolate Chip Bread Pudding with an unbelievable Custard Sauce – life is delish. So yeah, after purchasing the donuts, I waited two days for them to get stale and then popped them into the freezer for another 3-4 days. I am basically trying to tell you that you need some pretty old donuts to make this recipe a success. Because donuts are so light and fluffy, they actually aren’t the best thing to use to make bread pudding. You need them to be able to soak up all that yummy liquid that will really make this bread pudding come to life. Otherwise you’ll be left with a soggy mess, which is not great. Super old donuts = Amazing Bread Pudding. And amazing it was. This bread pudding is a dream come true for me. You all know that donuts are my favorite and chocolate… well, I’m sure you get the drift. And as if the bread pudding in and of itself wasn’t enough, I tried my hand at making a homemade custard sauce. More is definitely better. 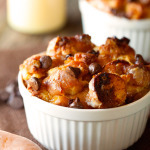 If you had no idea that this bread pudding was made with donuts, you would definitely be able to guess that is was once you take your first bite. So much glazed donut flavor going on here. Plus, bread pudding. Similar to a French toast bake, yet different. Much more delicate and melt-in-your-mouth wonderfulness. If you’ve never tried bread pudding, you must. And why not start with this one. Did I mention there’s chocolate inside and a creamy sauce that pulls it all together?! Here’s to a fabulous Hump Day already! 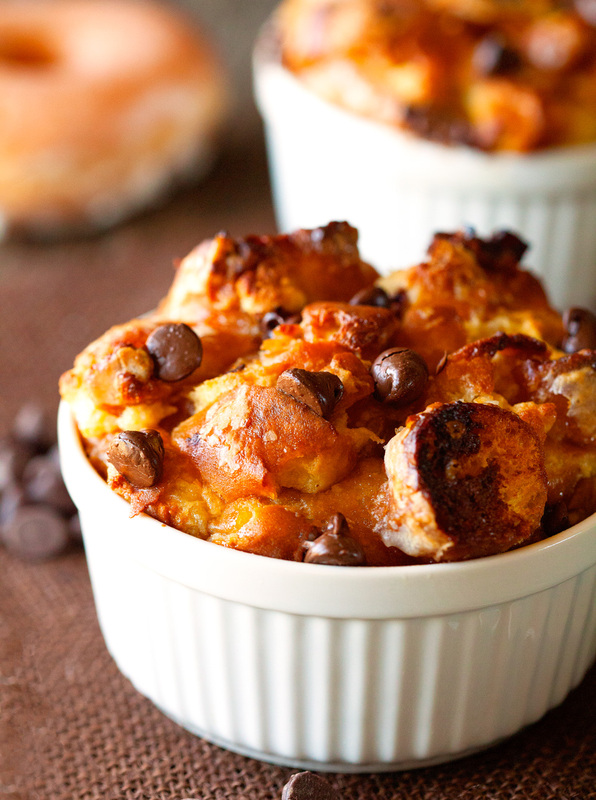 Glazed Donut Bread Pudding is a dream come true. Served with a Custard Sauce that is out of this world! Spray two ramekins with nonstick spray. Set aside. 1. Cut donuts into 1 1/2-inch pieces. 2. In a medium saucepan, combine milk, sugar and salt. Give it a good stir and heat over medium-low heat until sugar is completely dissolved, about 3-5 minutes (don't let it come to a boil). Take off the heat and let cool slightly. 3. Meanwhile, in a large bowl, whisk together the egg, egg yolks, and vanilla extract. Add cinnamon and nutmeg and give it a quick stir. Whisk in the milk mixture until combined. Fold in donut pieces and chocolate chips. Divide evenly between the ramekins or bowls*, if desired. Cover with plastic wrap and place in the fridge for 2-3 hours. 4. Preheat oven to 375 degrees F. Place ramekins into the oven and bake for 45-60 minutes or until bread pudding is set, golden brown on top and no longer wobbly inside. 5. While the bread pudding is baking, prepare the dreamy custard sauce. In a medium saucepan, stir together milk and salt. Bring mixture to a boil while stirring very frequently. In a medium bowl, whisk together egg yolks and sugar until light and pale, about 2 minutes. Once milk has come to a boil, reduce heat to low and pour 1/2 cup of the hot milk into the beaten egg mixture while whisking constantly. Once combined, pour egg mixture into the remaining milk in the saucepan - whisking vigorously as well. Continue to whisk mixture while it cooks over low heat until it begins to thicken, about 3-4 minutes. Make sure your heat is in low. Too high and your eggs will start to curdle. Pour custard sauce into a syrup dispenser and serve alongside bread pudding while still warm. 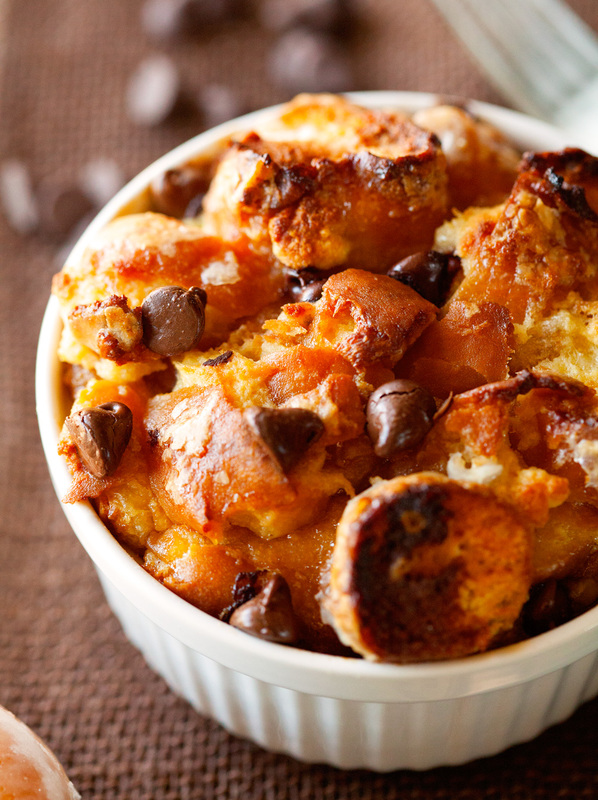 Bread Pudding is best when enjoyed immediately and while still warm. *I used two 6 ounce ramekins and filled them relatively full. You could use smaller ramekins or oven-safe dessert bowls instead, serves 2-4. Recipe for the custard sauce adapted from the kitchenmccabe.com. Oh my gosh I love bread pudding! I love that you made a custard sauce to go with it as well and the fact that you use glazed doughnuts YUM! Easier was to make custard topping for a bread pudding; 1 box instant vanilla pudding; 1 can evaporated milk, 1/4-1/2 c milk and 1 tsp vanilla. Wisk together , use milk to thin out your pudding to how thick you want it and pour over bread pudding. large or small box of vanilla pudding? This has revolutionized my idea of a bread and butter pudding, which is my favourite winter dessert. I often try to use different types of bread such as croissants or brioche as the base but never thought of doughnuts. Amazing, must try this! Ok, so that takes some serious self-control. I for one could NOT have lasted that long. I may have to put my better half to the test in keeping me away from any donuts so that I can actually make this recipe, because, girl, this looks INCREDIBLE! Pinned! 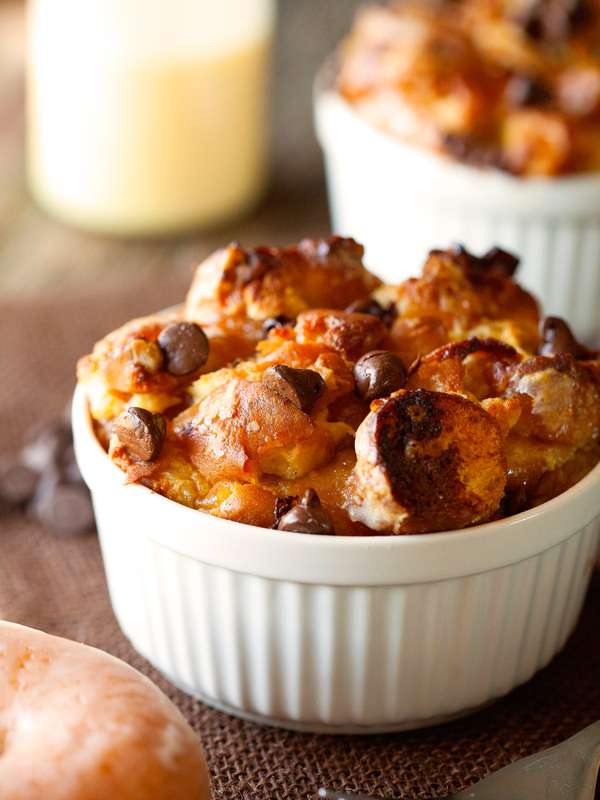 I think you have stumbled onto a seriously good idea here using donuts in a bread pudding. I can only imagine how good this must have tasted. Definitely a recipe I MUST recreate – I love that it’s so versatile too… I can so see myself making a chocolate version of this pudding! You know how much I LOVE doughnuts. They’re my weakness! I don’t think we’ve ever had a leftover doughnut at our house. It would require a lot of willpower. But it would be so worth if this bread pudding is the result! I have NO words… This looks INCREDIBLE! Honestly, that is one showstopping dessert! Never heard of anything like that. Looks good though! Incredible!! 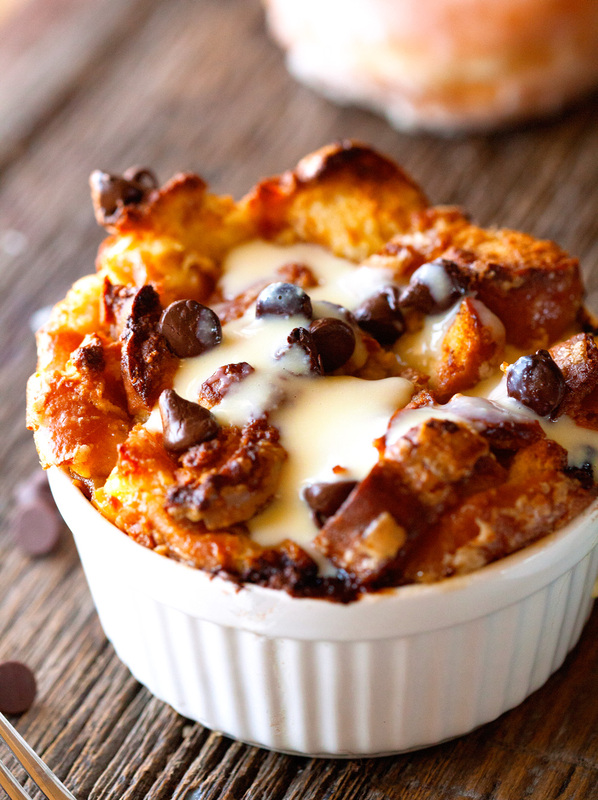 Donut bread pudding?? This sounds phenomenal, Kathi! I don’t know if we could let our donuts get stale but I’d be willing to try for this recipe and that dreamy custard sauce 🙂 Yum! Ahhh, I remember my first time ever making bread pudding at a cafe I managed with leftover caramel rolls. I had never had the stuff before and was bewondered by it. This donut version looks amazing! 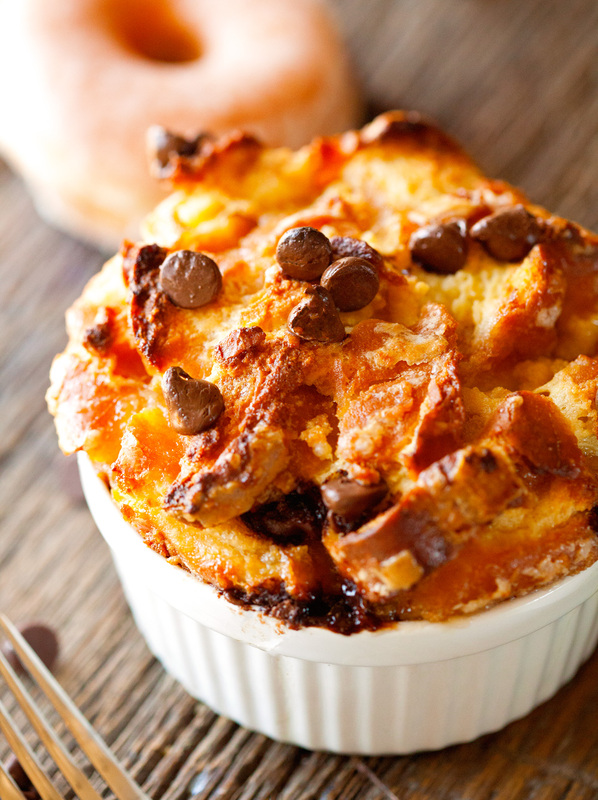 I adore bread pudding, and love trying variations! I’ll have to pick up a box of donuts the next time we’re at the store and then I’ll definitely give this a try! It looks AMAZING!